Loved meeting Ben Mackinnon founder of E5 Bakehouse today with Vanessa Kimbell (of www.sourdough.co.uk). Ben started out preparing dough at home and borrowing a wood-fired oven from a pizzeria each night to bake. 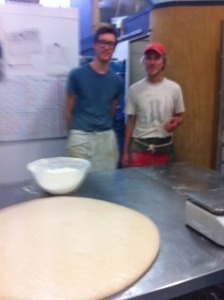 Now prepares Hackney Wild sourdough in batches of 30 kilo dough with 72 hour fermentation of wild yeast. Bakes up to 1000 loaves a week. Fascinating too tasting their sourdough made with British heritage wheat milled by Gilchester’s Organics in Northumbria – far more moist dough with real bite and distinct flavour. Sets the bar for properly sustainable loaf with high mineral content and low food miles. Delicious chickpea & kale stew with British sheep’s cheese too for lunch in cafe.